Similar to the Sanicare 900 bidet, the Sanicare 1000 adds extra controls for a more customized and comfortable bidet cleaning experience. The Sanicare 1000 also allows you to use both cold and warm water hookups. The Sanicare 1000 remains a bargain and offers hot/cold bidet spray and adjustable controls at a price that’s much lower than what the competition offers. 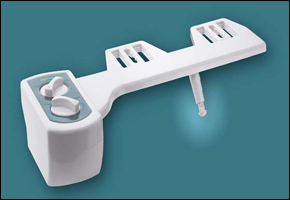 The Sanicare 1000 bidet is a great way to enter the world of bidets without spending a fortune. One Comment on "Sanicare 1000 Bidet"
This is great, I am in America right now where the concept of a bidet is a very foreign one. This snaps right into your existing toilet and does exactly what it says it does. It also allows you to hook it up to warm water, makes for a very enjoyable experience :). For the price you can’t beat it, I don’t think there’s anything cheaper around that will give you a warm stream. And I like that it is portable so I can most likely take it home with me.